Whenever you make or receive a phone call, or FaceTime, your device will make a record of it in your iPhone's Call Log. If you wish to save this Call Log, for backup purposes, or for legal reasons, you can use iBackup Extractor. You can easily copy your logs to your computer, or print them out! Download and Install iBackup Extractor, if you haven't already. Launch iBackup Extractor by double-clicking the iBackup Extractor icon on your desktop. Select a backup from the list which you would like to access. Click the Call Logs tab. Select a contact who's logs you would like to extract, and click "Copy Call Logs"
iBackup Extractor allows you to browse and copy any Call Logs you have backed up from your iPhone. To view all Call Logs stored on your iPhone backup, click the Call Logs button in iBackup Extractor. iBackup Extractor displays a list of contacts or numbers who have called you or been called by you. Clicking on a name/number in the list displays the Call Log pertaining that person. iBackup Extractor will display information such as the date each call was made and the contact name or number, if this call was missed or unanswered, and how long the call lasted. 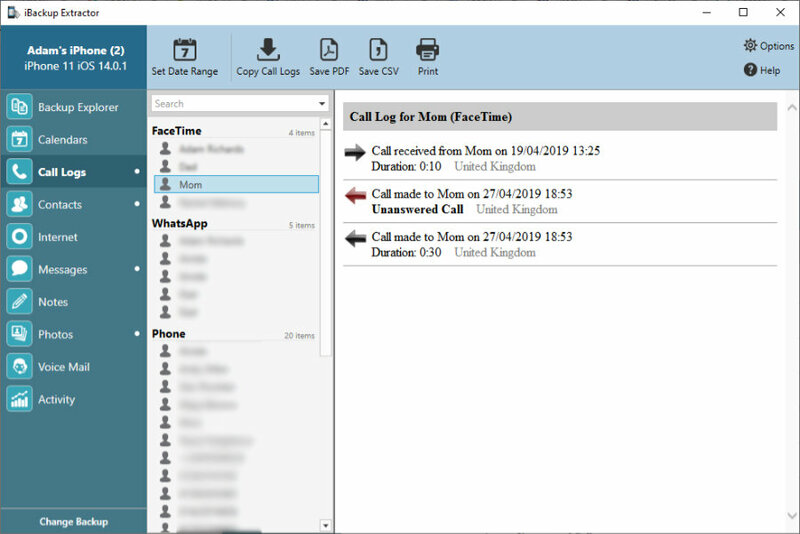 Select which call logs you wish to extract by selecting one or more entries on the display list, then press "Copy Call Logs" in the Call Log browser. iBackup Extractor will then ask you where you want the data saved, and an HTML file containing the Call Log data will be created. If no entry is selected, the entire collection of Call Logs will be extracted. You can also copy your Call Logs as PDF. To do this, select the Call Log/s that you wish to save, and hit "Save PDF". You can also print Call Logs using iBackup Extractor. To print, simply select the entries you wish to print, and hit Print. After clicking Print, your default print options will be displayed. Once you're happy with the options, click Print!